Join today and get $25 off your first order when you use the code "CLICK HERE" at checkout! Bombfell wants to drop a style bomb on your wardrobe. Each month, this clothing subscription service sends members a selection of hip, contemporary men’s wear for both at home and at the office. But is this subscription box a blast to use, or is the service a dud? Our in-depth, 100% honest review starts right now. Continue reading this Bombfell review to see if this clothing subscription service has the clothes to get you that specific men's style you have been looking for! First, what’s up with that strange name? Bombfell stands for “bomb fellow,” which is a combination of the words “bombshell” and “fellow.” So, basically, a bombfell is a stylish guy. Bombfell has a pretty narrow focus, but for a specific demographic, these boxes have a lot to like. The clothes are exclusively men’s wear with an emphasis on upscale, classy, and contemporary style. 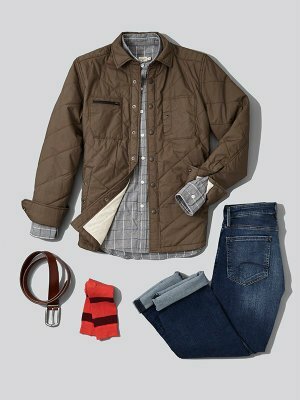 Clothing is roughly split between boardroom designs and looks suitable for casual activities like happy hour and dates. Bombfell’s main selling point is the personal stylist. Each subscriber is assigned a real, live fashion professional who works with you to pick clothing selections. Whether you don’t know much about style, or are simply too busy to shop, Bombfell is almost like a fashion consultant company. Sign up is designed to appeal to guys who don’t want to waste time. First, you provide a variety of info about yourself such as your measurements and style preferences. Whatever your body type is, Bombfell has a stylist that will make sure you get the perfect fit every time! Then you’ll set the price point for each type of clothing. Bombfell is very budget friendly. If you don’t have much to spend, you can set low limits on shirts, pants, shorts and accessories – but even the low price points offer plenty of selection. If any of the higher priced items, such as jackets and shoes, are out of your price range you can simply exclude them from the boxes entirely. Next, you request specific types of clothing. For instance, if you want a few shirts and a pair of shoes, they’ll pick some options in those categories. If you want to be completely surprised, that’s also an option. Before each shipment, you’ll receive an email previewing that month’s items. You have 48 hours to cancel or change any of the items. You can request specific substitutes or just general changes. Finally, your box will arrive. You’ll have seven days to try on the items. If you like something, it’s yours to buy and keep. If not, you can return it with ease. Shipping both to and from Bombfell is free for subscribers. Pricing is designed to be flexible. Subscribers can select their price range for each individual piece of clothing. For instance, if you want to spend a fair amount on shirts and jeans but not so much on jackets or belts, you can set different price limits for each. Simply set your price limits, and your stylist will select a fit within those boundaries. Each month you’ll be charged a $20 fee. This is for the stylist and outfit selections. What you spend beyond that really depends on what clothing you want to keep. The average price of an item is $89 with a general range between $10 and $200. You can buy any, all, or none of the items in each month’s box. The $20 fee is added as a credit towards your purchase. All members have free shipping, returns, and exchanges. Generally, reviews are pretty positive. One consistent theme we noticed was guys felt Bombfell helped them break free from a fashion rut and explore new styles. Subscribers were able to expand their personal styling with previously unknown brands. The personal stylists get high marks. Many reviewers mentioned that their stylist felt like a knowledgeable friend that provided great service to them. The stylist starts with an understanding of what you like but then adds and enhances your wardrobe with clothes you likely normally wouldn’t consider. Reviews also mentioned how easy the system is to use. Many subscribers were students and busy professionals. They were able to build a wardrobe without having to spend a lot of time picking out clothes or returning unwanted items. Bombfell uses both human professionals and a design algorithm to analyze your purchases and preferences in order to make clothing recommendations you’ll love. Other services, notably the Four Five Club, only use algorithm-based selections. While this can offer some general ideas, usually the selections feel a little impersonal. If you want that personal touch only a live stylist can offer, you’ll prefer Bombfell over Four Five Club. Another advantage Bombfell has over other subscription services is the wide selection of clothing. Now, Bombfell only offers contemporary men’s clothing. But if that’s your style, you’ll find a lot to choose from. If you’re looking for both men’s and women’s fashions, Stitch Fix might be the better option. But if you’re a guy shopping only for yourself, Bombfell provides the most variety. The average prices of Bombfell are pretty reasonable but nothing amazing. The $20 stylist fee is pretty standard for similar services. While there are some high-priced items available, Bombfell also offers lots of clothing at very reasonable rates. Even guys with a reasonable budget can build up a wardrobe with Bombfell. Looking to discover new brands? Bombfell has a nice combination of brands you’ve heard of and ones to discover. Popular brands include Grayers, Ben Sherman, Original Penguin, 7 Diamonds and more. Sign up is pretty easy. While the automated sign up generates enough info and style preferences to get you started, you’ll want to pay attention to the preview email. This is an email which details the upcoming shipment. Changes you make to the preview email help the stylist learn your fashion preferences. Items have an average cost of $90. Bombfell purchases their clothes wholesale. So prices for subscribers are usually the same as what you’d find in a retail store or sometimes even lower. Bombfell was created by Jason Kim and Bernie Yoo, roommates at Harvard who met over a shared knowledge on web systems and a shared confusion over fashion. Their initial goal remains a focus for the business even today: Combining tech and human expertise to help guys find nice clothing that is always a good fit. Does Bombfell have work clothes? Absolutely! Whether your office is modern and casual or old-school and formal, Bombfell can help you build a full wardrobe for work. Bombfell understands that in a company or work atmosphere, you need to dress the part! Does Bombfell have casual clothes? They do. Bombfell has shorts, hoodies, short sleeves and other clothing options designed for hanging out and keeping it comfortable. Do you have any questions not covered by this Bombfell review? Feel free to ask them in the comments section below! If you’re the type of guy who wants to improve your personal style, but don’t have a clue where to start, then Bombfell is definitely worth consideration. The site’s style algorithm combined with human professionals can help you create a personal style which is comfortable but fresh. However, if you’re not interested in contemporary men’s wear for the office and home, you might prefer another online styling company such as Trunk Club or Stitch Fix. Both of those services have a wider selection. Have you used Bombfell's online personal styling service yourself? Post a comment below describing your experience with the service. Would you recommend it to others? Bombfell has an admittedly weird name but their service has a lot to offer including flexible shipping and a wide selection of designer brands for men. The professional stylists will help you refine and create a style which looks good at work and play. Plus, they offer a wide variety of price points and discounts suitable for any budget.